nice . so close to Christmas. and by the way, do you know that in clock applet you can set also weather ( you are using weather report applet I suppose). you need only set your location. Thanks Maroman. Thats a good looking Holiday desktop theme! I am aware that the clock applet provides current weather conditions. The difference seems to be that the dedicated weather applet provides not only current weather but also an extended forecast, something that I find handy. Best of the Season to you and yours!.. I very much prefer the 'classic' gnome2 look. Great looking desktop Adrint. Clean and classic looking. 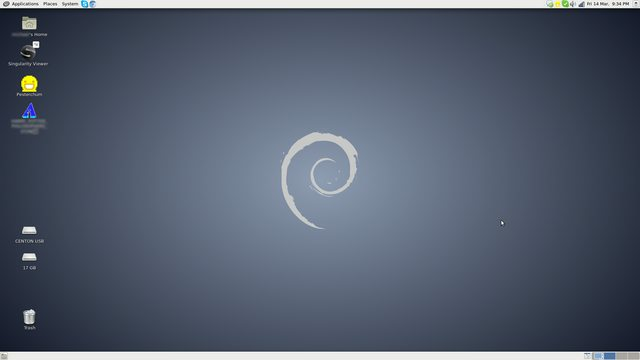 The Debian wallpaper is a nice touch! Az4x4 wrote: Great looking desktop Adrint. Clean and classic looking. The Debian wallpaper is a nice touch! As a matter of fact, I came to find Point Linux while I was on the search for a Debian based Distribution with a Gnome2-like Desktop Environment. I was sort of disappointed with the official release of Debian 7 Wheezy, and I sort of missed the look and feel of Debian 6 squeeze. Adrint wrote: ..Honestly, I think the Gnome developers have lost their minds with that they're doing with Gnome3.).. You're in good company there Adrint. Linus Torvalds famously said, concerning the Gnome3 desktop, that it was little more than an "unholy mess" if memory serves me well. Little wonder that Gnome2, brought back to life in MATE project, has come on so strong and been adopted by so many distros these past couple of years. People want and need the power, control and traditional sensibleness they enjoyed with their Gnome2 desktops, and MATE offers that in spades! My latest Point Linux MATE desktop..
nice Az4x4. but what about resources?? just pure screen plus conky (no conky no linux, bat at conky indicates network connection) and changeable wallpapers. I have a few hundreds of wallpapers and it is good opportunity to see them one by one. instead additional lanucher (docky, wbar etc) I use panel icons.